Truly grand, for more than a century. Grand Hotel has always embraced its rich history, but kept up well with the times. Today, guests enjoy modern amenities while the hotel’s original architecture, charm and relaxing ambiance have been tastefully preserved. 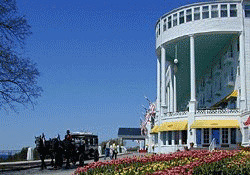 Contributing greatly to the hotel’s ambience is the relaxed atmosphere of Mackinac Island, where cars are not allowed and the horse and carriage and bicycle are favored modes of transportation. 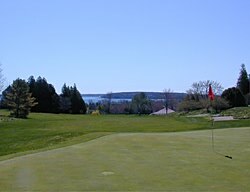 The Jewel is comprised of the Grand nine, across the street from the hotel; and the Woods nine, set in the interior of Mackinac Island. The Jewel features unparalleled scenic beauty, lush landscaping and meticulously manicured tees, fairways and greens. The Grand nine was built in 1901 and redesigned in 1987 by prominent golf course architect, Jerry Matthews. He also designed the Woods nine, added in 1994. Full breakfast and five-course dinner are included daily in most guest room rates. Guests 11 years old and younger stay and eat free. Significantly reduced rates are also available for guests 17 and younger. 385 Rooms, and no two are the same. Click here for info on accommodations. Thanks to many activities and kids’ programs, the readers of Travel + Leisure Family magazine consider Grand Hotel one of the 10 kid-friendliest resorts in the U.S. and Canada. Grand Hotel was named by the National Trust for Historic Preservation as One of a Dozen Distinctive Destinations. Grand Hotel has also received a number of distinguished awards, view the list.